Curse Inc has been a portal for a variety of different gaming websites, originally founded in 2008. 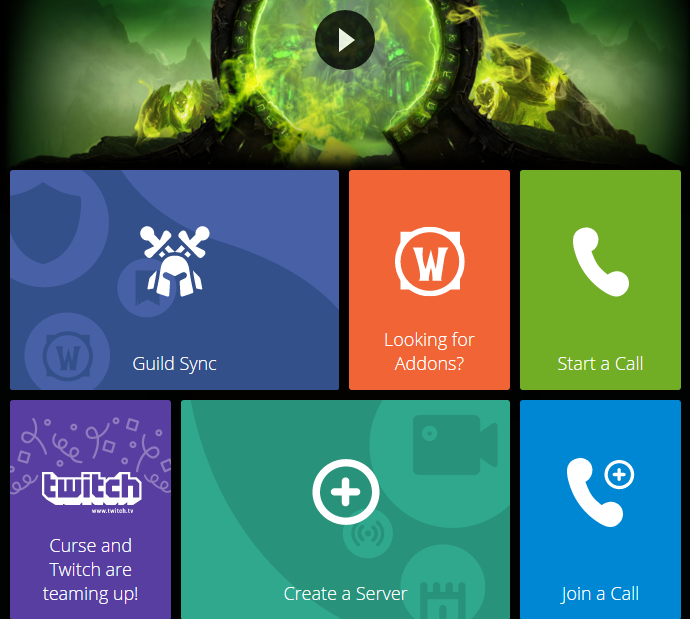 Curse’s latest addition to their portfolio is the Curse app, an application with a growing array of features, such as World of Warcraft addon management, and more importantly, a platform to create and manage online communities. More specifically, the Curse app boasts several features specifically designed to enhance the experience your viewers can have while you’re offline, and can even allow you to collect meaningful opinions on important matters! 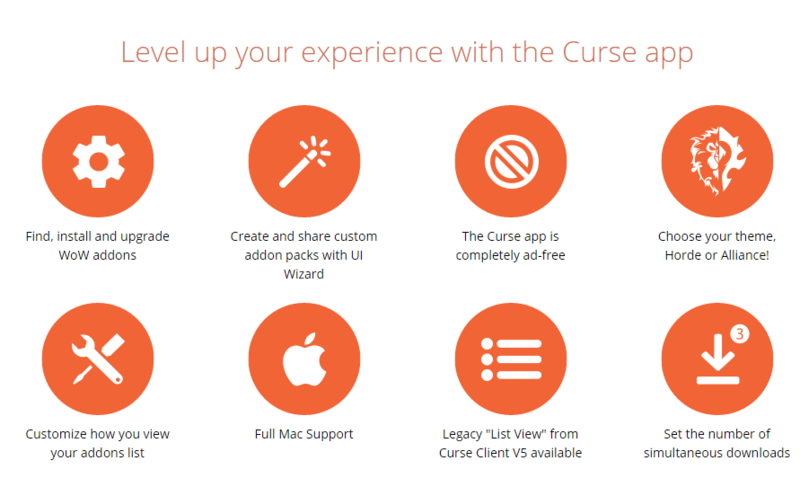 Downloading the Curse app is easy – just head to the Curse’s website and select the version you require (PC/Mac). Run the installer like any other program, and the Curse app will be installed on your computer. After the app has installed, you will be prompted to sign in to your Curse account. 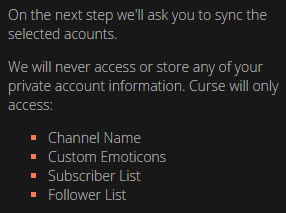 Whilst World of Warcraft and Minecraft users may already have a Curse account, simply press ‘Create an Account’ and follow the onscreen instructions to create your own Curse account. After logging in, you’ll be presented with the Home screen – a summary of the different things you can do with the app, along with the latest Curse news. The green portal shown below relates to the launch of World of Warcraft’s latest expansion, Legion. 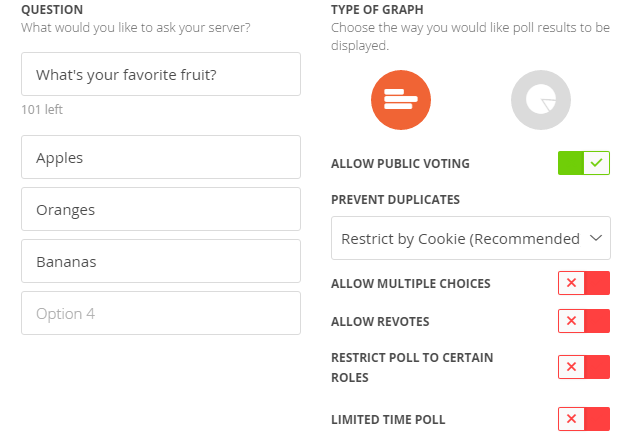 Selecting the last option, ‘Create a Server’, will prompt you to specify what the purpose of the server is: are you a content creator, World of Warcraft guild, Team/Clan or would you prefer a custom server? 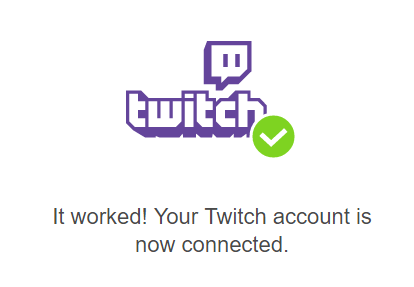 After authorizing the Curse App to access the information, your Twitch account will be synced and your server will be open to customization. That’s it – select ‘Let’s Go!’ and your very own Curse server has been created. 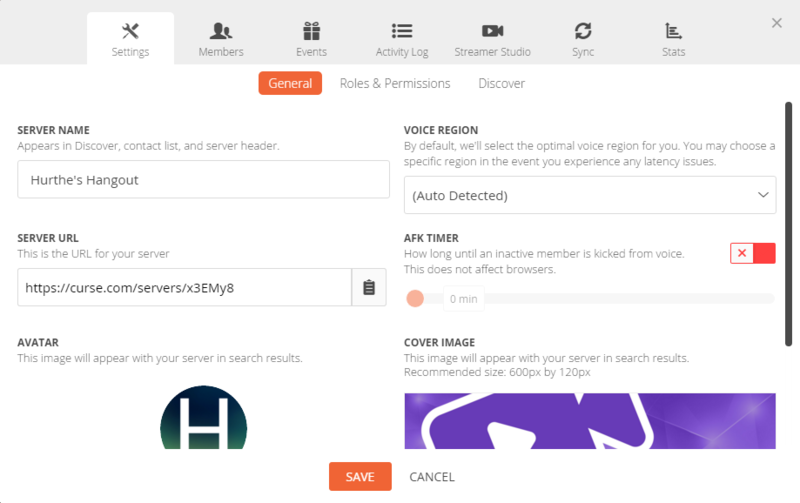 Pressing the cog will open the Admin Panel, where your server’s settings can be found. The several tabs will allow you to access a wide variety of customization and information. Note: Partnered Twitch streamers will have the option of a custom Curse URL (www.curse.com/streamername). 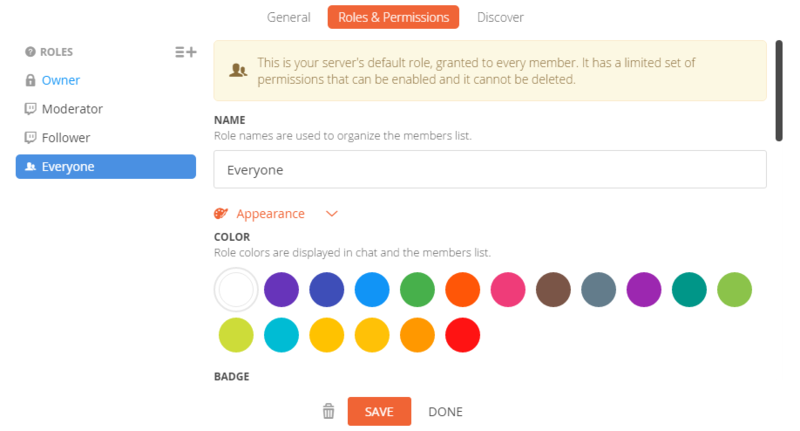 Members of your server can be split into different ranks, which are fully customizable. You can use them to split your viewers into subscribers, moderators, normal viewers, etc. Along with granting these ranks different privileges (banning, promoting) the ranks will share different colors, making recognition of different ranks easy in chat. These ranks can be managed from the ‘Settings‘ tab. Through their chat bot, Curseappbot, Curse can automatically assign the ‘Follower’, ‘Subscriber’ and ‘Moderator’ ranks to users who have synced their Twitch accounts with their Curse ones. Of course, the rights that these ranks hold are fully customizable by scrolling down the page below. 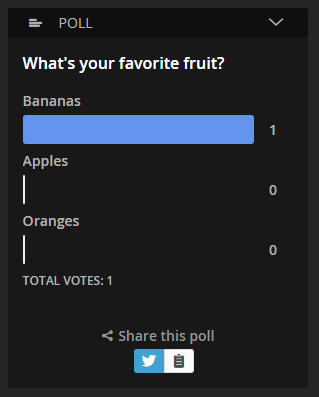 The ‘Events‘ tab holds the features that make the Curse app especially good for streamers and content creators wanting an offline community – not only can polls be created to determine the opinions of your userbase, but you can also host giveaways exclusively to those on your Curse server. When you are happy with the options, select ‘Create Giveaway’ to launch the giveaway. 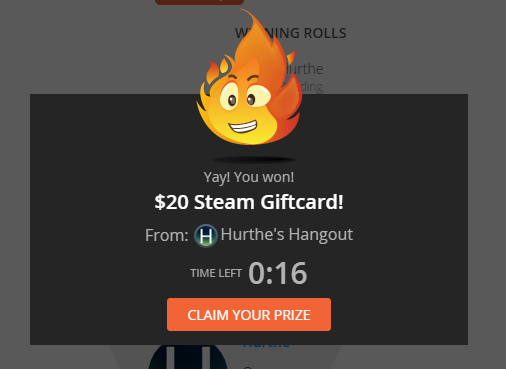 Like a poll, all members will receive a notification that the giveaway has commenced, and the giveaway can be tracked live underneath the channel list. The ‘Activity Log‘ will display a list of recent events that have taken place in your server, whether it be members joining, a record of the latest giveaways and their results, or anything else that has happened that Curse keeps a log of. This tab allows streamers to examine their Curse server, especially in relation to their Twitch stream. 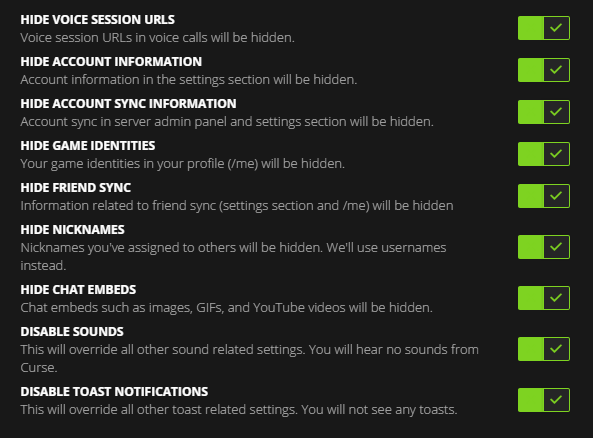 Curse will display a list of Twitch subscribers and their relevant Curse information, along with several other features that haven’t been announced yet, which include: the ‘Info’ section; a ‘Chat Bot’ section; and the ability to enable/disable Streamer Mode. ‘Streamer Mode‘ is a option available to Twitch streamers that will alter their Curse experience when streaming. By default, Curse technology will detect when you start to stream with OBS or XSplit, and will automatically enable Streamer Mode. 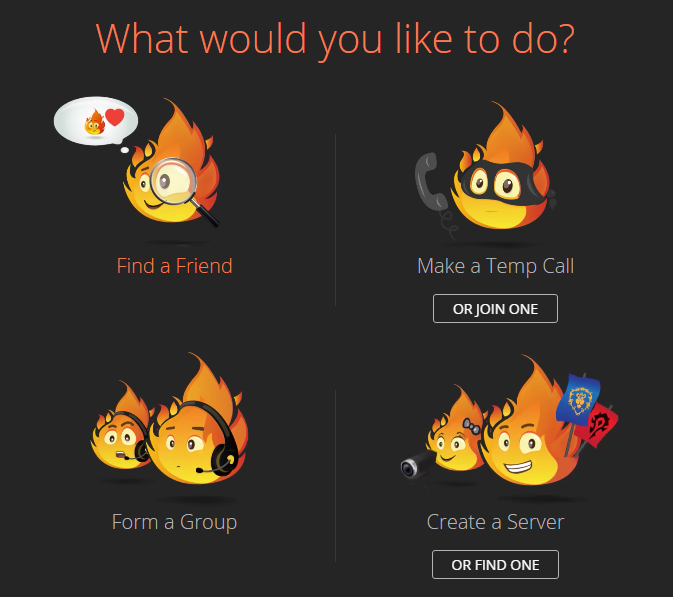 The Curse client allows your community to engage and chat with each other. Of course, moderation will be needed in some situations – as a result, Curse allows you, and moderators you employ, to ban and delete users’ messages as and when you need to. 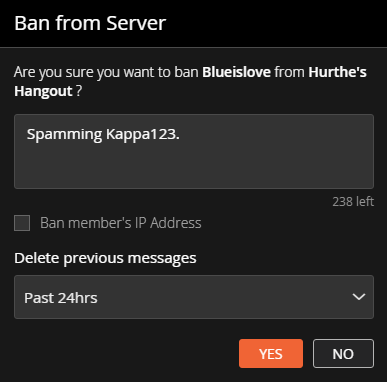 In addition to banning a user moderators may also ban a user’s IP address (meaning they can’t join on multiple accounts) and, if desired, delete all the messages they have entered within a time frame you wish. 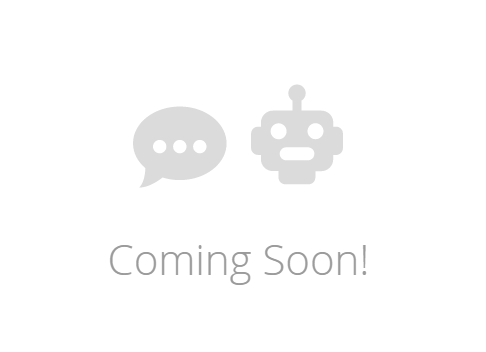 … and the user will have been unbanned. Some of Curse’s features have not been implemented into the app yet. However, when these new features are released, this guide will be updated accordingly. Moderator for a few people.